It’s no secret that I’m a huge Venus Williams fan. And can I just say that this one hurt? Well, it did. It’s true. To see her fight back over and over again, from the brink of defeat so, so many times, and then to lose it because of THAT VOLLEY. You know the one I’m talking about. The volley that would have given her match point, but instead put her down match point. The volley miss that was SO BAD it brought the seven-time major champion to her knees. The one where the ENTIRE COURT was open, and she botched it into the net. 2. That being said, I had forgotten how much fun it was to watch Zheng Jie play tennis. She is such a great mover and competitor, and always surprises me with how she can hang in there from the baseline. I went to her results page to try and figure out what has happened to her this year, and I don’t see any major time off, just a whole lot of first-round matches. In fact, as much as we talk about Venus’ rust, Zheng hadn’t won a match since the French Open coming into the U.S. Open. Still, she loves the fast courts and has made two Grand Slam semifinals, so she certainly knows how to play the big matches. There’s really no reason why she should be ranked No. 56 in the world–she’s way better than that. 3. Venus Williams can still play tennis. She certainly proved that in her first-round match against Kirsten Flipkens, the No. 12 player in the world. And she can still fight her heart out, as she showed multiple times today. The problem that I’ve seen with her throughout the past two years is that she just can’t string it all together. She wants it so, so badly that she starts to push, which leads to spraying forehands, botching volleys, and service yips. And, as her coach confirmed tonight, she’s insanely stubborn, and not good at going to a “Plan B” when her tactics aren’t working. She’s always been this way, and she used to still manage to have a lot of success. But these days, her “A-game” isn’t around for as long, so she’s going to have to be more open to adjustments if she wants to hang around. 5. I don’t care what anyone says. She looks absolutely, positively FABULOUS. I love everything about this ensemble, and I think the hair is the best. I Venus! And her air! I never thought I’d like something better than when she went full Mia Farrow, but this is great! HOWEVER: “there’s no reason [player A] should be ranked [lowish ranking], she’s much better than that” is one of those things tennis people say that drive me crazy. Judging from all the players various people insist “should be ranked higher” I’d have to guess that they also want to invent some kind of new math, because I’m counting like sixty top twenty players, at least! There absolutely, 100% is a reason Zheng Jie is ranked so low. SHE DOESN’T WIN ENOUGH MATCHES. In a highly competitive pursuit, the differences between 10 and 56 can be pretty marginal and, very often, about things other than “talent.” Zheng Jie could be ranked higher. She’s probably considerably more talented than a number of women ranked in front of her. But, for whatever combination of reasons, she can’t get it done (at the moment) and Errani can. I totally agree with these five points. Zheng is a fantastic player and seems to match up really well against big hitters like Serena, Maria and sadly, Venus. If only she’d made that volley :(. 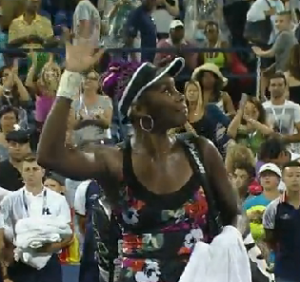 It also irks me when the press and fans keep calling for Venus to retire. She’s not taking anything away from them (food, money, shelter, wildcards, etc.) and will always be remembered for her accomplishments instead of these recent struggles. That she can still compete in such a compelling manner should be a reason for encouragement instead of derision and disdain. When she finally steps away from the game, who’s going to be able to inspire the type of discussion that she does? Besides her sister, who?? Although he may be an excellent hitting partner (and, for all I know, a fine person), I’ve never been impressed with Venus’ coach. Oddly, Witt is just a few weeks older than the WTA, having been born in June 1973, not long before the famous meeting at the Gloucester Hotel in the lead-up to Wimbledon. As Joshua pointed out, the difference in the WTA between a player ranked #10 or #12 and a player ranked #60 is miniscule nowadays. Zheng has won 48% of her total points played this year; Sara Errani, who has been ranked 5-7 for much of the last year, has won only 52% of her total points. Radwanska has only won 53.8% of her points. The parity in the WTA (apart from the top three) explains two important phenomena which even many so-called expert commentators seem to get wrong – the paucity of teenage stars, and the remarkable increase in the strength of the tour over the last twenty, thirty,forty years. When there are players as dangerous and experienced as Mattek-Sands,Zheng, Schiavone, Bouchard, Wickmayer, and Venus ranked between #51 and #60, it has to be next to impossible for a youngster nowadays to put together a string of confidence building victories. Date-Krumm, Vekic, Erakovic, and Pironkova are in the #60’s, and Watson, Peer, Shvedova, Pennetta, Martic, Razzano and Medina-Garrigues, are ranked between #70 and #100. There are no easy matches nowadays. The other night we saw Azarenka beat #99 Pfizemaier 6-0, 6-0, and if you looked only at the score, you would have thought that the German player had put up no resistance whatever. But if you watched the match, you know that Dina was in a great many of the games. In fact, she won 34 points. Now 34 points may not sound like much compared to Azarenka’s 61, but 34 points in 12 games is nearly 3 points a game. That great depth on tour nowadays – the strength of the players ranked #11-#150, clearly demonstrates that the Azarenkas and Sharapovas of our time are tremendous players to have set themselves as far above the field as the Grafs and Seleses did twenty years ago. People forget that, until her spill at Wimbledon, Sharapova had only lost one match this year to anyone other than Serena. And most people would give Vika the edge over Maria. Twenty, thirty years ago, the top players almost always waltzed into the quarterfinals and often into the semi-finals, without ever having to face a dangerous player. Nowadays, many players will have to beat three or four dangerous players JUST TO GET INTO the Quarterfinals. Venus, for example, would have had to get by Flipkens, a current #15, Zheng, a past #15, Suarez-Navarro, a current #20 and Kerber, just to get into the QF’s — where she’d have had to face Serena Williams! It’s a tough road, nowadays. Previous Entry: Changeover Podcast Episode 36: Nerdcast Vol. 1 – What Wins Tennis Matches?